With Christmas fast approaching and people hitting the city in droves this weekend – why not pop into our lovely city gardens in between the present hunting for a truly festive event. Iain Richardson writes re. this Saturday’s Winter Festival at Union Terrace Gardens to celebrate prize art work by city children. The winners of an art competition for children will receive their prizes at a Winter Festival in the centre of Aberdeen this Saturday, 17th December. 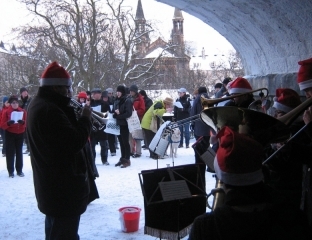 Christmas-themed artwork by Aberdeen school children will be on display at the event in Union Terrace Gardens on Saturday 17th December 2011, between 1pm and 3.30pm. The Winter Festival will feature the Bon Accord Silver Band, carol singing, Yousedancin ceilidh band, Santa, Cairngorm reindeer, and free festive food and drink. “We’re just thrilled at the response to the competition. The children’s art is stunning and we’ll be displaying as many of the 300 or so entries as we possibly can on Saturday, as well as handing out prizes to the winning children”. The prizes for the winning Art Competition entries in each of three age groups will be presented to children at approximately 1.30pm on Saturday 17th December, at the Arches in Union Terrace Gardens. Nearly 300 entries were received from primary schools and individual children in and around Aberdeen.